Babe is a 25 year old Belgium/Quarter Horse cross. She is a beautiful sorrel color with white mane and tail. 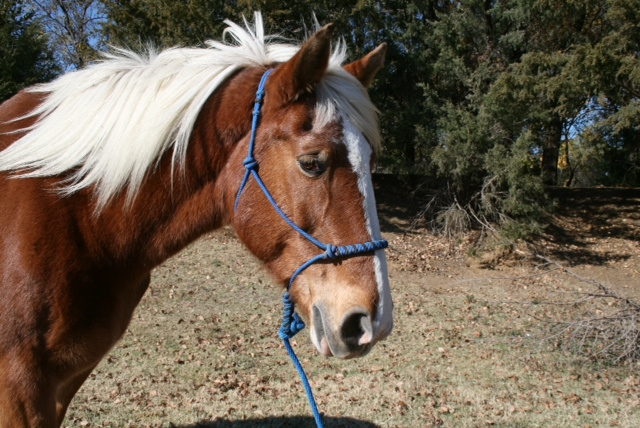 Babe is one of our three draft horses that are an important part of our program. Before coming to Rocky Top 11 years ago Babe used to pull a wagon. After she was donated she sometimes pulled the Rocky Top wagon with one of our other draft horse, Jasper, in parades and special events. Babe doesn’t pull the wagon anymore because of her old age but she is still a wonderful therapy horse. Because of her size she is perfect for use in our physical therapy program. Babe is nice and wide and perfect for kids to do things like sit-ups and getting on hands and knees while she walks. Babe is super calm and gentle. Even though she is super big she is always gentle around people. When she isn’t working she likes to hang out with her friends in the pasture. One of her newest friends in our champion steer Reeses. She and Reeses are often seen together.